Ram swim team still undefeated! 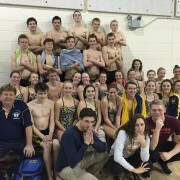 The boys and girls swim team defeated York on Friday December 18 to remain undefeated. The boys won 50-43 and girls won 59-35.
https://wjccschools.org/lhs/wp-content/uploads/sites/20/2015/12/York.jpg 948 1264 Daniel Gotthardt https://wjccschools.org/lhs/wp-content/uploads/sites/20/2017/10/Lafayette-High-School.png Daniel Gotthardt2015-12-22 11:26:092015-12-22 11:26:09Ram swim team still undefeated! Mr. Aadahl’s engineering class recently refurbished 53 donated computers and 40 printers under the Virginia Student Training and Refurbishment (VASTAR) program. In one generous night of giving, the refurbished computers and printers were donated to the community and to students in need. 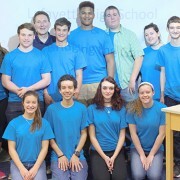 Mr. Aadahl’s engineering class is pictured with Principal Anita Swinton and Student Advancement Coach Archie Jefferson. The library will be closing at 2:30 today…enjoy your break. Bayport will also be hosting “Winning Wednesdays” where a student member will be drawn to win a $25.00 gift card every week. If you are interested in opening an account or purchasing a t-shirt please visit the Bayport desk during your lunch. Auditions for The Wizard of Oz will take place Tuesday, January 5th through Wednesday, January 7th after school in the auditorium. See Mrs. McCorry to pick up your audition packet in the Black Box Theatre (room 623). The LHS Theatre Department wishes you a great holiday, enjoy this time with your family and friends. Remember as Dorothy says, “there’s no place like home”. 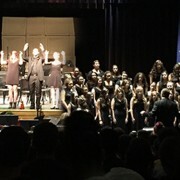 Lafayette staff and students were treated to a Holiday concert by the Performing arts classes, including Band, Chorus, and Orchestra. For a special treat, the American Sign Language performed a beautiful rendition of Silent Night with the Chorus. Only students with special permission will be allowed to use the clinic bathroom. Please use the bathroom closest to your classroom. If you are between classes and need to see the nurse, please check in with your classroom teacher prior to coming. Also, the clinic is closed from 1:00-1:30 pm for lunch, except for emergencies. Staff & students – the girls basketball team is collecting gently used toys and games to donate to the Children’s Hospital of the King’s Daughters. Donations will be collected during all three lunches this week. Attention all current and former German students – we will be hosting our end of year German Club meeting today after school in room 628 from 2:30 to 3:30. Please come and join us for German cookies, beverages, cookie decorating, arts & crafts, games and more. New members are always welcome. The annual membership fee is $ 7.00. Be part of the Lafayette High School spring musical – THE WIZARD of OZ! Try a new experience – acting, singing and dancing. Auditions are open to all students…no theatre experience necessary. Auditions are Tuesday, Jan. 5th through Thursday, Jan. 7th. See Mrs. McCorry in the Black Box Theatre (room 623) to pick up your audition packets. The library will be closing at 2:30 today. We will resume our normal schedule tomorrow. Attention future AP Biology students – if you are signed up to take AP Biology in the spring, please see Mr. Beard in Room 309 today during AEP. Attention all current and former German students – we will be hosting our end of year German Club meeting this Thursday after school in room 628 from 2:30 to 3:30. Please come and join us for German cookies, beverages, cookie decorating, arts & crafts, games and more. New members are always welcome. The annual membership fee is $ 7.00. Micheal Tyler set the school record and personal best in the high jump reaching the 6’9″ mark, in the Bay Rivers District #1 meet. Way to go Mike keep reaching higher. Seniors: Are you unsure of how you’re going to pay for college? 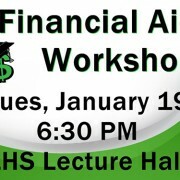 Then come to our Financial Aid Workshop on Tuesday, January 19th, at 6:30 p.m. in the Lecture Hall. See Mrs. Pottle in the Counseling Office if you have any questions. Attention Freshman, Sophomores and Juniors – picture retake day will be on Wednesday, December 16th. Picture order forms are available in the main office. Follow the yellow brick road…the LHS spring musical is “The Wizard of Oz”. Do you like to act, dance and sing? Auditions will take place after the holiday break, Tuesday, January 5th through Thursday, January 7th after school in the auditorium. Auditions are open to all students, no theatre experience necessary. Please see Mrs. McCorry in the black box theatre (room 623) for an audition packet. This past weekend at the CNU Invitational, the girl’s 3200 meter relay consisting of Delaney Savedge, Audrey Hurley, Serenity Chavez and Brook Crookston took first place. Brook Crookston was also first in the 1600 meter run. Audrey Hurley was second in the 300 meter dash. Delaney Savedge was also second in the 3200 meter run. 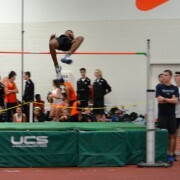 Mike Tyler was second in both the high jump and triple jump. Derrick Abson was second in the 300 meter dash. Go Running Rams! 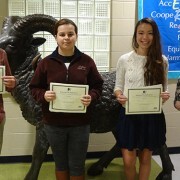 Both Sierra and Hannah are moving on to the district-level Reflections competition.